With art, ideas, and entertainment, UMBC will add spark to the second annual Light City Baltimore festival, running from March 31 through April 8 in the Inner Harbor and throughout the city. The evening celebration of light and its companion series of daytime innovation conferences — the Labs@LightCity — will prominently feature UMBC faculty, staff, students and alumni as artists and thought leaders. Launched by the Baltimore Office of Promotion and the Arts in 2016, Light City Baltimore is the first large-scale international light festival in the United States, and last year attracted more than 400,000 visitors. Members of the UMBC community (alumni, faculty, staff, students, and friends) are invited to visit the Black and Gold Lounge on Saturday, April 1, from 8 to 11 p.m. at the Harbor Club at Pier V, right on the path of the BGE Art Walk, offering an incredible elevated 180-degree panoramic view of Light City. Attendees to this free event will enjoy complimentary food and drink, and can pick up glow-in-the-dark swag (first come, first served). 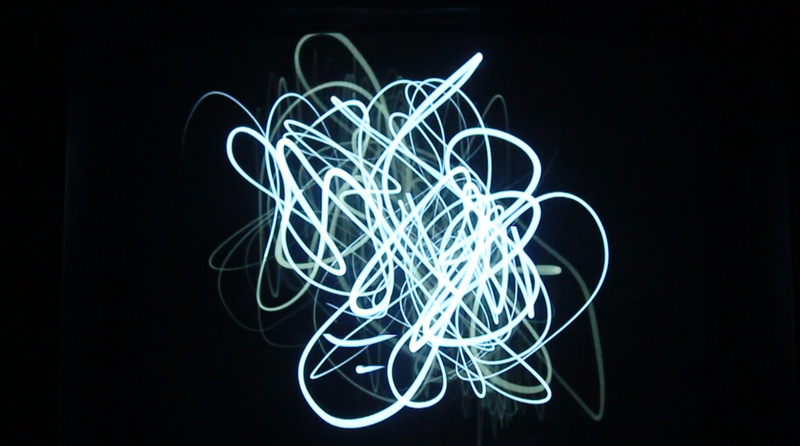 Two visual arts faculty — associate professor Eric Dyer and professor Timothy Nohe — are among the major artists on the BGE Light Art Walk, which will feature large-scale artworks that were selected through an international competition. 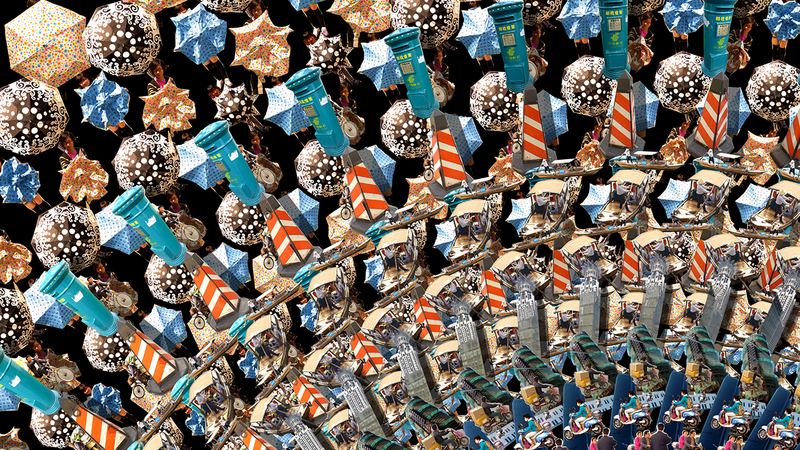 Dyer’s work, Shabamanetica (detail above), which will be located on Pier 5, “takes the form of two large spinning sculptures that evoke ships’ wheels,” explains the artist. Spin a sculpture, and images on its face come to life with the aid of an over-arching strobe light. The animations combine imagery from Shanghai, Panama, and Baltimore: three places connected anew by the recent expansion of the Panama Canal and dredging of the Port of Baltimore in preparation for the gigantic Super Neopanamax container ships. One sculpture considers industrial heydays — Baltimore’s past versus China’s young and blossoming — with umbrellas as the common thread, set over a landscape of Panamanian highland waterfalls. The other presents the awe-inspiring ‘machine’ of canal operations and questions what it’s all for. The daytime Labs@Light City, a series of six innovation conferences dedicated to sparking social change, will explore topics such as education, health, and design. The Labs will be held at the University System of Maryland (USM) Columbus Center on Pratt Street. 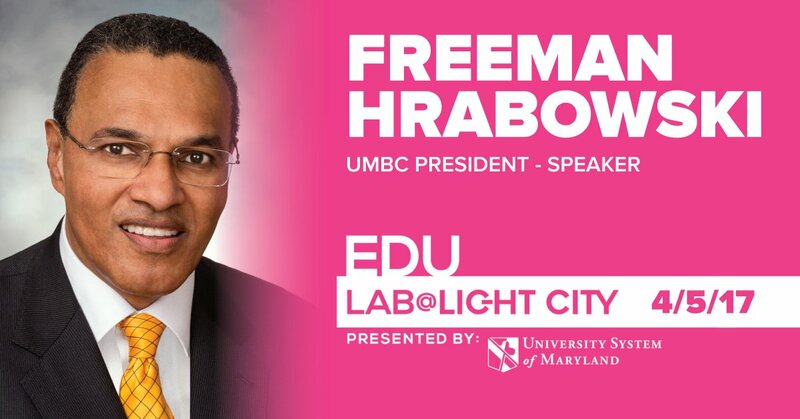 USM will sponsor EduLab on Wednesday, April 5, at which UMBC President Freeman Hrabowski will discuss “The Path to the Future” with author Alec Ross, exploring how we look to the education system, business, and government to help cities like Baltimore tap into the promise of the industries of the future. At HealthLab on Monday, April 3, Gymama Slaughter, associate professor of computer science and electrical engineering, will speak on “The Body as a Battery,” in which she will discuss how the body’s chemical energy can be harnessed to power wearable and implantable sensors that diagnose and monitor diseases. Additional UMBC faculty who will speak at the Labs include Chris Swan, associate professor of geography and environmental systems; Lee Boot, director of the Imaging Research Center; and Kimberly R. Moffitt, associate professor of American studies and affiliate assistant professor of Africana studies and language, literacy, and culture. 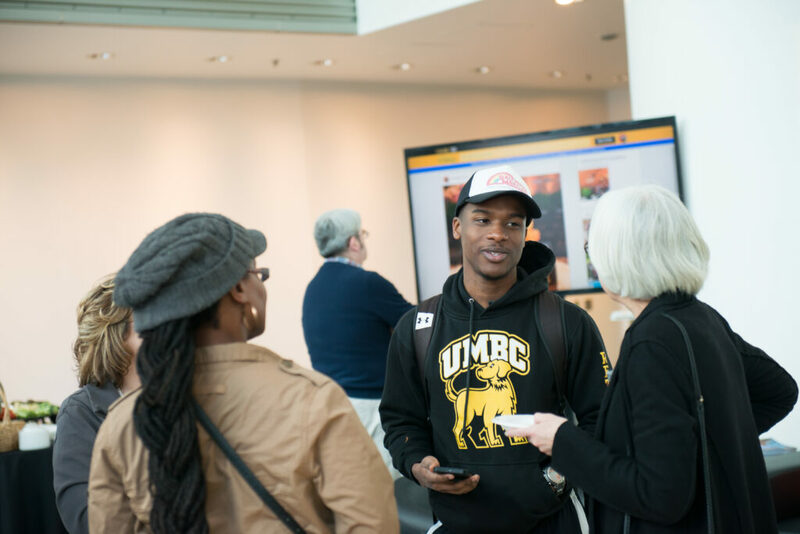 Lab attendees will also hear from UMBC alumni Maritha Gay ‘84, health science and policy; Greg Cangialosi ‘96, English; and Joseph T. Jones ‘06, social work. UMBC SPARK, a pop-up gallery of engaging, projection-based artworks, will be open at Calvert and Water streets nightly, 5 – 10 p.m.
Made possible through the vision and generosity of PNC, the gallery is produced by the Downtown Partnership of Baltimore and features the work of UMBC faculty (including Kelley Bell, Cathy Cook, Symmes Gardner, Lisa Moren, Jules Rosskam and Sarah G. Sharp) and graduate students. 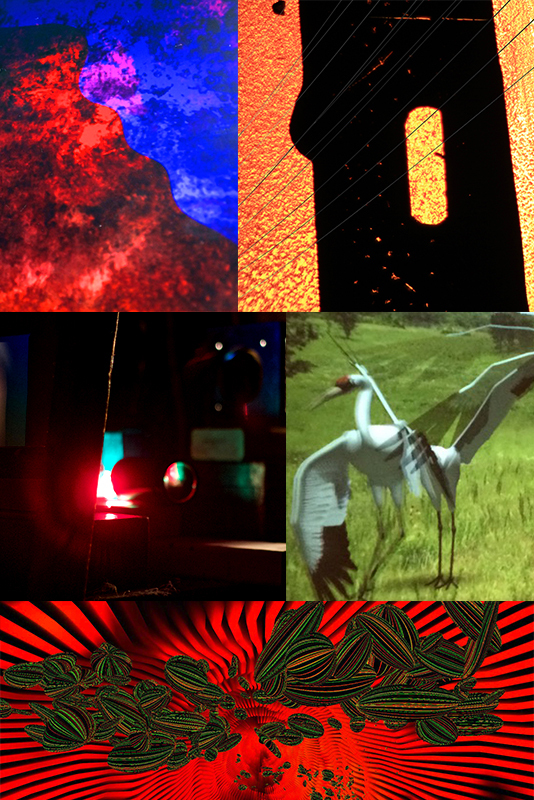 The gallery is curated by Joe Reinsel, a Baltimore based artist who uses new media, video, and sound to explore ideas about architectural space, time, and touch. UMBC SPARK also features a schedule of special events, including performances by UMBC’s Baltimore Dance Project and the UMBC Percussion Ensemble, a special showing of films by Stan VanDerBeek (former chair of visual arts), an animation workshop by assistant professor Corrie Parks, and a visiting artist talk by Elizabeth Daggar. Artworks by UMBC faculty, staff, and students (including Cathy Cook, associate professor of visual arts; Corrie Parks, assistant professor of visual arts; and Catherine Borg, arts publicity coordinator) will be featured in “On Demand,” a Light City celebration of digital content along the BGE Light Art Walk. For complete information on UMBC’s presence at the 2017 Light City Baltimore festival, visit UMBC’s Light City webpage. Images: Where not specified, images are courtesy of the artists.